The Medicinal Chemistry Divisions of the two Belgian Chemical Societies, Société Royale de Chimie (SRC) and the Koninklijke Vlaamse Chemische Vereniging (KVCV), are organising every year an international one day symposium in Belgium, with the aim to update participants on selected areas of pharmaceutical research by specialists in their respective field. In recent years, this symposium has been gathering every year around 170 participants, half from universities, half from industry, both from Belgium and surrounding countries. It has been focussing on topics such as "New Vistas in GPCR Research: the Dawn of an Exciting Drug Discovery Era?" (2014); “Constrained Peptides and Macrocycles – New Opportunities for Drug Discovery” (2013); “From Rapid Dissociation to Irreversible Inhibition – Optimisation of Drug-Target Residence Time” (2012); “Emerging Targets and Treatments: Opportunities and Challenges for Drug Design” (2011); “Does size matter? Beyond small molecule therapeutics: challenges and success stories“ (2009); “Small molecules, Antibodies and Natural Products: Multiple Faces of Medicinal Chemistry” (2008); or “New Drugs and Drug Candidates: Recent Achievements in Medicinal Chemistry (2007)”. 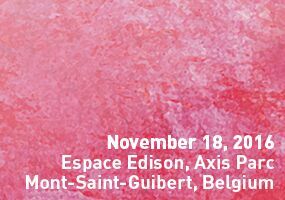 MedChem 2016, with six invited lectures and three oral communications, will be held on Friday November 18, 2016, at the Espace Edison – Axis Parc in Mont-Saint-Guibert. The title and focus of the symposium will be “PET & Imaging : From Chemistry Lab to Clinical Applications”. The objective of the one-day symposium is to delve into the latest developments around Positron Emission Tomography (PET) and Imaging as invaluable non-invasive translational evaluation and diagnostic tools in drug discovery. Medicinal chemistry now plays a critical role in the design, the synthesis and the characterization of suitable ligands with very specific properties. A sightseeing tour around state-of-the-art synthetic methodologies, tracers design and optimization principles, recent applications and perspectives in various therapeutic areas as well as selected case-studies will be presented.